kidney stone or other renal disease. Early gout cases can be controlled by only diet. But Chronic gout can be treated with Aura Homeopathy medicine, Dr.Abhishek recommend long term treatment so as to stop further damage to cartilage, bone and kidney. Old gout cases usually develop tiny, hard lumps in the soft tissue of feet, hands, or earlobes. this deposit of crystal is known as tophi. Tophi is basically accumulation of uric acid crystals, which are the main cause of stiffness, inflammation and pain. Kidney malfunctioning which leads to decreased excretion of urates in urine. H/o injury or surgical procedure. diminished renal excretion of uric acid. Initial attack in maximum patient is reported at Joint of a big toe, there after ankle joint, heel joint, knee joint and hand joint may be affected. Affected joint become red, hot, swollen with sever pain. Accessorie symptoms can be anorexia, fever, headache, malaise, change of mood or nausea. may not be very useful because hyperuricaemia, without any symptoms, is very common. X-rays is of less use for the diagnosis, it may show punched-out erosion along tissue swelling of tophi. Dr.Abhishek advice low protein diet, with complete restriction to non-veg food and alcohol. As per Dr.Abhishek, pulses must be replaced with lots and lots of vegetables and fruits in diet. Prefer whole grain like rye, oat meal, corn, millet and brown rice. Always keep you hydrate by drinking lots and lots of fluids , including fruit juice, water and herbal tea. Pulses and nuts should be taken in less quantity. Avoid green leafy vegetables like spinach. Avoid Fruits, which are rich in sugar. Excess Salt and spices should be avoided. And in case gout runs in family history, he should avoid intake of alcohol, and high-purine food, and must keep a check on their weight.Blood urea level and urine tests are adviced in routine checkup. Aura Homeopathic treatment provide best Treatment for Gout. As per Dr.Abhishek there are more than 188 homeopathic medicine found to be very useful in gout condition. Best homeopathic medicine for gout can be selected on the basis of studying the constitution in detail. In allopathy usually painkillers are prescribed which tend to suppress the symptoms and leads to dangerous side effects such as kidney and liver failures, if used for long term. 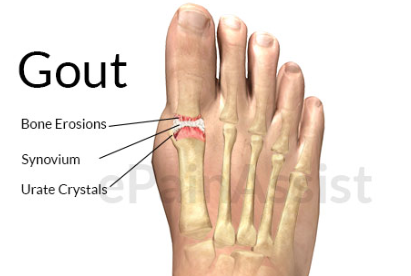 Aura Homeopathy focuses on curing the root cause of gout. Dr.Abhishek usually advise to tapper off your allopathy in car patient is already on allopathy medicine.